New job, new remit, new blogs - August was a tricky month trying to work out where I stood in two new organisations, what the hell I was supposed to be doing and trying to get whatever 'it' was done right. 1st: The Modern Foreign Languages Environment entered a new phase as I was able to shift contribution from elites to the masses - officially. 9th: I get to know Neil Winton and he makes me add "Social Media Responsible Use" to my to-do list. We now have active policies in LTS and East Lothian. 13th: Flock was the best browser I have ever used - I don't touch it now. 14th: Loic breaks the news of MyBlogLog which I share with my edu-audience. One of the most popular startups of 2006. 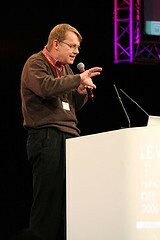 15th: I first discover Hans Rosling - it takes me five months to meet him in person. I also get a little bit burnt for pointing out that the Festival my organisation runs doesn't have wifi. They found some by the time the event came around a month later, though. Well, that evening blogging was mainstream enough to be on Richard and Judy, after all. 22nd: It takes me 22 days to work out what my job is. 27th: I get excited about the positivity surrounding a potential mobile phone trial at Musselburgh Grammar. Frustration at the end of the year, though, as hand-wringing and worry get in the way of innovation.